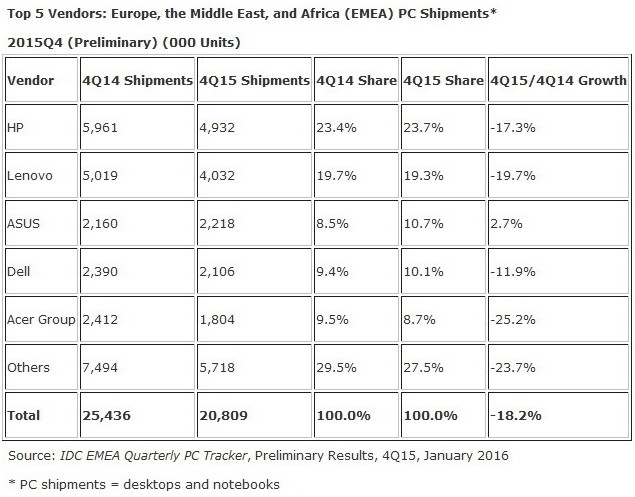 PC shipments have declined by 18.2 percent to 20.8 million units as of Q4 2015 according to analytics firm IDC. The International Data Corporation (IDC) announced its preliminary results for both Q4 2015 and the full 2015 calendar year for the EMEA (Europe, Middle East, and Africa) region. Accordingly, shipment volume fell sharply compared to Q4 2014 by as much as 18.2 percent. 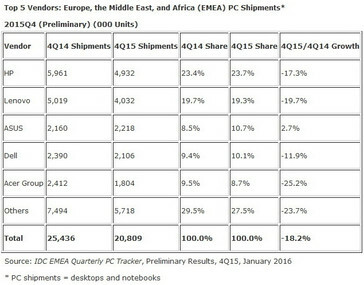 As for the entire 2015 year taken as a whole, PC shipments are estimated to be down 18 percent to 76.35 million units. 2014 saw a boost in PC sales due to the end-of-life support for Windows XP and the the generally lower prices of new hardware. Microsoft, for example, offered low-cost PCs with Bing pre-installed. Nonetheless, Associate Director of IDC EMEA Chrystelle Labesque claims that the market decline of 2015 remains in line with expectations. Removing Bing PCs from the equation for its 2014 results would put it closer to 2015 numbers according to her estimates. 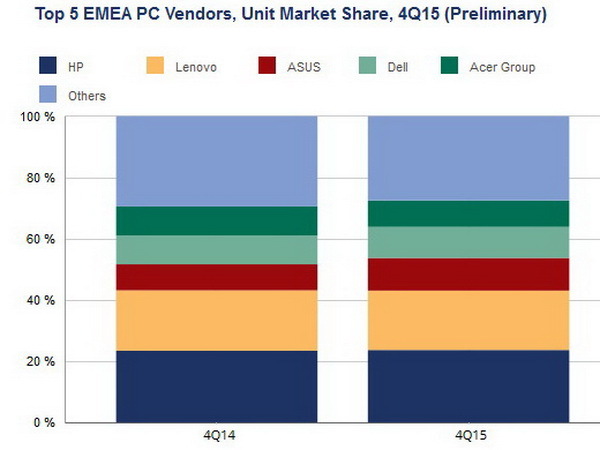 Associate VP of IDC CEMA Stefania Lorenz has stated that 2015 was indeed a very difficult year for the PC market. Demand during all four quarters were in double-digit declines compared to their corresponding quarters in 2014. The weakening market had a notable effect on the Top 5 ranking of the world's largest suppliers and manufacturers, which collectively account for more than 72 percent of the EMEA market today. 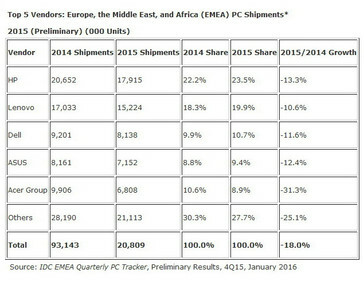 HP, Lenovo, Dell, Asus, and Acer make up the top 5 in that order in terms of shipment volume to the EMEA market. Acer slipped the furthest with a decline of just over 31 percent and subsequently losing its place to both Dell and Asus in the rankings. Apple, Toshiba, Fujitsu, and MSI follow in 6th, 7th, 8th, and 9th place, respectively. 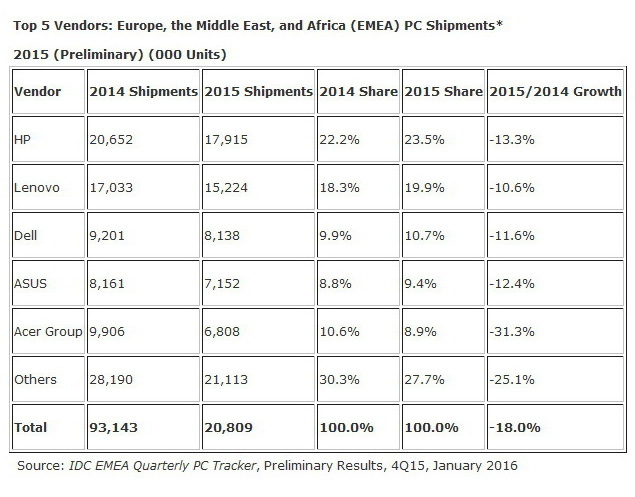 Note that IDC has confirmed an error in its preliminary table below. Instead of reading "20.809" under total shipments, it should instead read "76.35" to represent 76.35 million units shipped total.